Diwali is one of the biggest celebrations for an Indian family. Meaning of Diwali party for us increases because we spend quality time with family as well as there are lots of fun time. 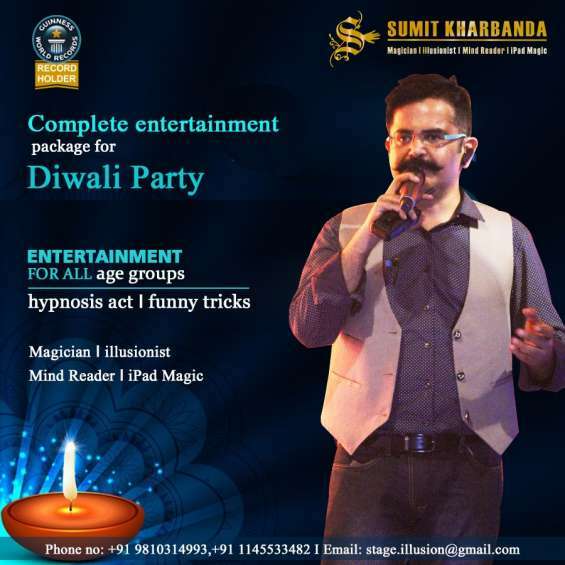 You can enjoy more your fun time and spend more quality time with your family by an excellent surprise performance by a professional entertainer in your Diwali party. That's personality is Mr Sumit Kharbanda. He has been inspiring with Magic since his schooling with more than 20 years of experience. He can entertain all type of audiences. Good entertainers are those who can make smile on every one’s face and Mr. Sumit Kharbanda is a perfect example. He is a professional entertainer who has outstanding skills in iPad Magic, Mind Reader, Close-up magician and lots of tricks for the enjoyment of parties. So what are you waiting for, make this Diwali celebration a big and memorable event by hiring us. Multiply your fun and enjoyment hundred times with one and only Mr. Sumit Kharbanda.